HOW TO PRACTICE TUMMY TIME? For your baby’s safety, place her on a firm, flat surface, like a carpeted floor. If your floor is wood, lay down a blanket to offer some comfort. Make sure to remove any pillows or soft toys near her face. As some babies not like to be on their tummies, offer distractions for her that could help them stay in the position. For example, lay down to look at your baby, with your face close to hers. Or, place a toy or a mirror in front of her, so that baby has something to look up and reach for. Tummy time is like strength training for babies – it helps babies to develop strong neck muscles, that will help them achieve all of the physical milestones- sitting, crawling, and walking. It will also helps to prevent flat head. Baby will start trying to lift her head to see what’s going around, but she won’t be able to hold her head up for long until she’s 3 or 4 months. Babies will use the tummy time position to roll over, scoot and support herself with her arms. WHEN SHOULD BABY START TUMMY TIME? The American Academy of Pediatricians (AAP) recommend to start tummy time on the day baby comes home from the hospital. Remember to only do tummy time when baby is awake and alert. A good time for baby to be on her stomach is after a diaper change or a nap. HOW MUCH TUMMY TIME IS APPROPRIATE? In the beginning, start with two or three times a day for about three to five minutes each session. As your baby gets stronger, you can gradually let your baby stay on her stomach for a longer period of time. Some babies will not be happy with being on this stomach, but you shouldn’t be discouraged! Try to keep him on his tummy for three to five minutes, but if he refuses, reduce it to one or two minutes. The time baby spends on her tummy should increase over time as baby gets older and stronger. Try to make tummy time fun for your baby, by putting rattle toys in front him and having your face close to his- your face is her favorite to gaze at! 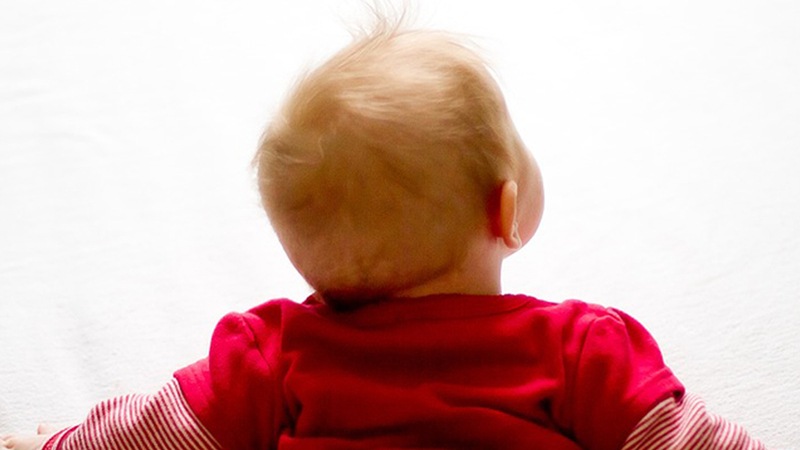 Make sure your baby is on a low, flat surface so she doesn’t risk rolling off of a couch or bed. If you have other children or pets, make sure your baby is out of harm’s way. Also, always supervise your baby while she’s on tummy time and don’t leave her alone, as she could get into a position that’s potentially dangerous. If your baby gets drowsy or falls asleep while on tummy position, switch her to his back for a nap. Never let baby sleep on her stomach because she can suffocate, potentially causing SIDS.